A tunnel between Brooklyn and the Battery in Lower Manhattan was one of a number of traffic-relief projects in the late 1930s conceived by Mayor Fiorello H. La Guardia to remedy vehicular congestion on New York City’s existing thoroughfares. Funds, however, were low with the Queens-Midtown Tunnel still under construction. The Public Works Authority and the Reconstruction Finance Corporation were not able to sufficiently finance the project, so Mayor La Guardia reluctantly asked Robert Moses, the chairman of the Triborough Bridge Authority, for the funds. Moses said that he could supply more than 30 million dollars, but only at the price of taking over the Tunnel Authority, which was in charge of the Queens-Midtown Tunnel and the Battery Tunnel. In early September 1938, in a “Memorandum of Understanding,” Moses agreed to help finance Mayor La Guardia’s plan.1 In return, the Mayor agreed to ask the New York State Legislature to allow Moses to assume the responsibilities of the Tunnel Authority. On January 22, 1939, three months after the Board of Estimate approved the building of the tunnel, Moses announced his intentions to build a bridge instead. Opposition quickly coalesced among a group of prominent New Yorkers, including central figures of New York’s Good Government Movement and the Citizens Union. Opposition to the bridge was driven by a number of factors. Preservation of Battery Park, its view of the river, and its view of New York City’s skyscrapers were some motives; the preservation of Brooklyn Heights was another. Others joined the opposition in order to preserve Castle Clinton, which at that time housed the McKim, Mead and White-designed Aquarium. Many people opposed building the bridge for fiscal reasons, mainly the expected decrease in real estate value and the subsequent loss in real estate tax. On January 25, 1939, Borough President Stanley M. Isaacs met with the press and described the colossal dimensions of Moses’s bridge and how it would dominate the landscape and block light from entering surrounding buildings. Moses subsequently published a brochure that estimated the cost of the bridge to be 41 million dollars and the cost of the tunnel to be 84 million dollars. The engineer, Ole Singstad, however, calculated that the tunnel would cost only 65 million dollars, and that over the next 20 years the bridge would cause a loss in real estate taxes amounting to more than 29 million dollars. Walter Binger found that the new connections that would have to be built to the bridge would cost nearly 22 million dollars. Moses’s estimate did not account for these associated costs. Despite these findings, in early March, the Planning Commission passed Moses’s project. Because Moses had amassed such power as head of the Tunnel Authority, the Parks Commission, and the Bridge Authority, it took a federal agency, the War Department, to block a bridge from being built across the Brooklyn-Battery crossing. This was, however, the result of sophisticated preservation efforts by civic leaders to save the Battery and build the Brooklyn-Battery Tunnel instead. This bridge was never built. April 5, 1939: Eleanor Roosevelt publishes her article "My Day"
Civic resistance to the bridge led to the formation of the Central Committee of Organizations Opposing the Battery Toll Bridge, headed by Albert S. Bard. The organization was able to rally support and membership from prestigious civic leaders, artists, architects, and other groups including the Fine Arts Federation, itself an amalgamated group of organizations. Mayor La Guardia also joined the ranks of the opposition when Isaacs revealed Moses's plan to force the City to pay 11 million dollars to build a connection between the bridge and the West Side Highway. Yet, at a seven-hour hearing before the City Council on March 27, 1939, Moses's plan was approved. Burlingham's influence on FDR and the First Lady went even further. Despite assurances from the Army Corp of Engineers in New York, the Federal War Department rejected Moses's proposal on July 17, 1939, because of the bridge’s position over a navigable waterway and the safety hazard caused by blocking the harbor. On July 20, 1939, the Central Committee of Organizations Opposing the Battery Toll Bridge celebrated with a victory luncheon. Burlingham’s clout was the decisive factor in defeating Moses’s plan. The opposition’s efforts, however, had a long-term impact on the historic preservation movement. The diverse coalition of civic leaders, politicians, and engineers; the opposition’s confrontation of Moses’s plan in front of every minor and major approving body; their understanding of the intricacies of government bureaucracy; and the opposition’s appeal to the public through visual aids were central to forming a constituency for historic preservation and providing a tactical and organizational model for subsequent efforts to protect important aesthetic and historic resources. 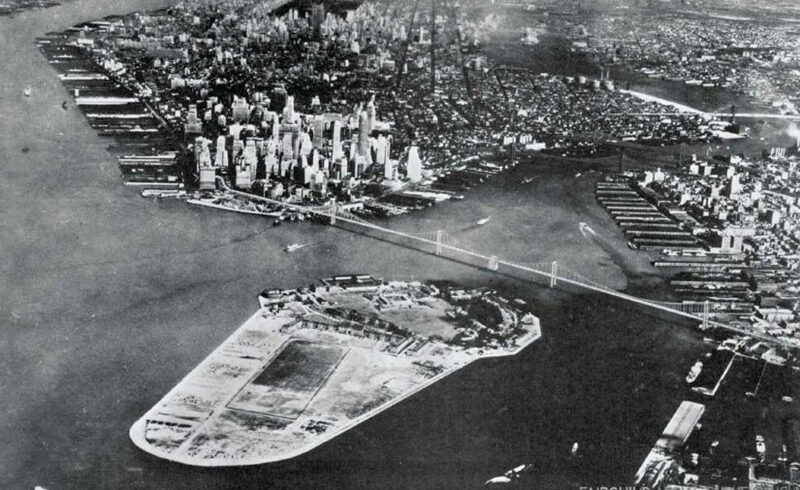 Robert Moses did not let his Brooklyn Battery Bridge defeat go unavenged. His thwarted plans ignited a clash over a cherished historic building in the Battery, Castle Clinton, that would last for decades between Moses and civic, scenic, and preservation groups. On February 6, 1939, he announced his plan to demolish the Aquarium, also known as Fort Clinton or Castle Garden. He described the Aquarium as near collapse and said that the construction of the Brooklyn-Battery Tunnel further threatened the Fort's integrity. This initiative not only drew opposition from New York City's public figures but from the individuals who comprised the Aquarium's 2,500,000 yearly attendance. On July 18, 1950, George McAneny succeeded in securing a Congressional bill designating Castle Clinton as a National Historic Monument. The Aquarium, however, was moved to Coney Island. The New York Times, the Herald Tribune, and the Brooklyn Eagle “Triborough Bridge and Tunnel Authority": a collection of audit reports on various city projects. For Singstad's and Moses's brochures and estimated costs see May 24, 1939. Located on Randall's Island - barred from public use. For Eleanor Roosevelt's article see "My Day." in the New York World Telegram, April 5, 1939. Robert A. Caro, The Power Broker: Robert Moses and the Fall of New York (New York: Alfred A Knopf, 1974), page 641. “5 Groups Condemn Moses’ Bridge Plan: Call it Ruinious to Skyline, Harmful to City and Harbor – ‘Same Old Tripe,’ He Says,” The New York Times, 27 March 1939. Robert A. Caro, The Power Broker: Robert Moses and the Fall of New York (New York: Alfred A. Knopf, 1974), pages 666-667. Eleanor Roosevelt, “My Day,” New York World Telegram, 5 April 1939.